“Slip and fall” is a blanket reference to slips, trips, and falls that result in injury. Slips occur due to a loss of traction between your foot (or, more likely, your footwear) and the surface you are walking on. It could be a wet surface, such as a freshly mopped floor, or a slippery surface, such as a freshly waxed floor.Trips, on the other hand, occur when your walking pattern is interrupted by an unexpected uneven surface. This could be attributable to a torn carpet, a carelessly placed box, or a change in elevation, such as an unmarked step. Falls can be a reference to what happens when one slips or trips. However, falls also refer to falls from one level to another, as well as when something falls onto you from a height. Below we answer some commonly asked questions about slip and fall accidents. I was recently injured in a slip and fall accident at the mall. Who pays for my injuries? 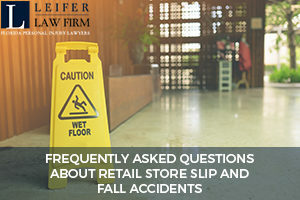 The answer to this question, like many areas of the law, is, “It depends.” Florida law holds retailers accountable for slip and fall accidents only if certain conditions are met. When someone slips and falls, the injured person must prove both that the business knew or should have known about the dangerous condition which led to the slip and fall, and that the owner should have done something about it. Because recovery is fact specific, let’s review two fact patterns to illustrate the point. Imagine you and your best friend decide rather than standing on the escalator like a grown adult, you decide to attempt to slide down the banister of the moving escalator. This injury is not created by a dangerous condition the mall owner knew and should have done something about. On the other hand, imagine you and your friend are at the mall during a rain storm. Imagine further the roof leaks, and the retailer knows this. Typically, they put out a bucket to catch the drops and keep the floor dry. But this time, they were busy with sales and didn’t put out a bucket. You slip on the wet floor, fall to the ground, and incur injury. This slip and fall accident is probably compensable. How do you prove a business “knew or should have known” about the danger? Actions such as previously putting out a bucket to catch the rain show the owner “knew.” The passage of time can provide proof that an owner should have known about a hazard, such as a torn carpet, just in the exercise of ordinary due care. What types of injuries occur with slip and fall accidents? According to the Centers for Disease Control and Prevention (CDC), falls are both serious and costly. The CDC reports one in five falls cause serious injuries, including broken bones and head injuries. Head injuries range from concussions to traumatic brain injuries. Slips and falls can also result in soft tissue injuries, torn muscles, and abrasions. What should I do if I have sustained an injury from a slip and fall? The first thing you should do if you slip and fall is take a moment to evaluate your injuries. If you need medical care, get it immediately. Finally, contact an experienced personal injury attorney. Don’t practice law without a license. While this blog post provides a brief overview of slip and fall accidents, only a licensed professional can adequately evaluate the specific facts and circumstances of your particular case. At the Leifer Law Firm, our personal injury attorneys are well versed in slip and fall accidents. Contact us to discuss your case at 561-660-9421.